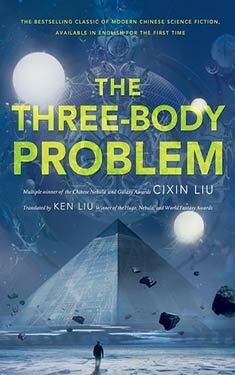 If you liked The Three-Body Problem you might like these books. With the scope of Dune and the commercial action of Independence Day, Three-Body Problem is the first chance for English-speaking readers to experience this multple-award-winning phenomenon from China's most beloved science fiction author, Liu Cixin. The Red Union commander was anxious, though not because of the defenders he faced. The more than two hundred Red Guards of the April Twenty-eighth Brigade were mere greenhorns compared with the veteran Red Guards of the Red Union, which was formed at the start of the Great Proletarian Cultural Revolution in early 1966. The Red Union had been tempered by the tumultuous experience of revolutionary tours around the country and seeing Chairman Mao in the great rallies in Tiananmen Square. But the commander was afraid of the dozen or so iron stoves inside the building, filled with explosives and connected to each other by electric detonators. He couldn't see them, but he could feel their presence like iron sensing the pull of a nearby magnet. If a defender flipped the switch, revolutionaries and counter-revolutionaries alike would all die in one giant ball of fire. And the young Red Guards of the April Twenty-eighth Brigade were indeed capable of such madness. Compared with the weathered men and women of the first generation of Red Guards, the new rebels were a pack of wolves on hot coals, crazier than crazy. The slender figure of a beautiful young girl emerged at the top of the building, waving the giant red banner of the April Twenty-eighth Brigade. Her appearance was greeted immediately by a cacophony of gunshots. The weapons attacking her were a diverse mix: antiques such as American carbines, Czech-style machine guns, Japanese Type-38 rifles; newer weapons such as standard-issue People's Liberation Army rifles and submachine guns, stolen from the PLA after the publication of the "August Editorial"1; and even a few Chinese dadao swords and spears. Together, they formed a condensed version of modern history. Numerous members of the April Twenty-eighth Brigade had engaged in similar displays before. They'd stand on top of the building, wave a flag, shout slogans through megaphones, and scatter flyers at the attackers below. Every time, the courageous man or woman had been able to retreat safely from the hailstorm of bullets and earn glory for their valor. The new girl clearly thought she'd be just as lucky. She waved the battle banner as though brandishing her burning youth, trusting that the enemy would be burnt to ashes in the revolutionary flames, imagining that an ideal world would be born tomorrow from the ardor and zeal coursing through her blood.... She was intoxicated by her brilliant, crimson dream until a bullet pierced her chest. Her fifteen-year-old body was so soft that the bullet hardly slowed down as it passed through it and whistled in the air behind her. The young Red Guard tumbled down along with her flag, her light form descending even more slowly than the piece of red fabric, like a little bird unwilling to leave the sky. The Red Union warriors shouted in joy. A few rushed to the foot of the building, tore away the battle banner of the April Twenty-eighth Brigade, and seized the slender, lifeless body. They raised their trophy overhead and flaunted it for a while before tossing it toward the top of the metal gate of the compound. Most of the gate's metal bars, capped with sharp tips, had been pulled down at the beginning of the factional civil wars to be used as spears, but two still remained. As their sharp tips caught the girl, life seemed to return momentarily to her body. The Red Guards backed up some distance and began to use the impaled body for target practice. For her, the dense storm of bullets was now no different from a gentle rain, as she could no longer feel anything. From time to time, her vinelike arms jerked across her body softly, as though she were flicking off drops of rain. And then half of her young head was blown away, and only a single, beautiful eye remained to stare at the blue sky of 1967. There was no pain in that gaze, only solidified devotion and yearning. And yet, compared to some others, she was fortunate. At least she died in the throes of passionately sacrificing herself for an ideal. Battles like this one raged across Beijing like a multitude of CPUs working in parallel, their combined output, the Cultural Revolution. A flood of madness drowned the city and seeped into every nook and cranny. At the edge of the city, on the exercise grounds of Tsinghua University, a mass "struggle session" attended by thousands had been going on for nearly two hours. This was a public rally intended to humiliate and break down the enemies of the revolution through verbal and physical abuse until they confessed to their crimes before the crowd. As the revolutionaries had splintered into numerous factions, opposing forces everywhere engaged in complex maneuvers and contests. Within the university, intense conflicts erupted between the Red Guards, the Cultural Revolution Working Group, the Workers' Propaganda Team, and the Military Propaganda Team. And each faction divided into new rebel groups from time to time, each based on different backgrounds and agendas, leading to even more ruthless fighting. But for this mass struggle session, the victims were the reactionary bourgeois academic authorities. These were the enemies of every faction, and they had no choice but to endure cruel attacks from every side. Those who survived that initial period gradually became numb as the ruthless struggle sessions continued. The protective mental shell helped them avoid total breakdown. They often seemed to be half asleep during the sessions and would only startle awake when someone screamed in their faces to make them mechanically recite their confessions, already repeated countless times. Then, some of them entered a third stage. The constant, unceasing struggle sessions injected vivid political images into their consciousness like mercury, until their minds, erected upon knowledge and rationality, collapsed under the assault. They began to really believe that they were guilty, to see how they had harmed the great cause of the revolution. They cried, and their repentance was far deeper and more sincere than that of those Monsters and Demons who were not intellectuals. For the Red Guards, heaping abuse upon victims in those two latter mental stages was utterly boring. Only those Monsters and Demons who were still in the initial stage could give their overstimulated brains the thrill they craved, like the red cape of the matador. But such desirable victims had grown scarce. In Tsinghua there was probably only one left. Because he was so rare, he was reserved for the very end of the struggle session. Ye Zhetai had survived the Cultural Revolution so far, but he remained in the first mental stage. He refused to repent, to kill himself, or to become numb. When this physics professor walked onto the stage in front of the crowd, his expression clearly said: Let the cross I bear be even heavier. The Red Guards did indeed have him carry a burden, but it wasn't a cross. Other victims wore tall hats made from bamboo frames, but his was welded from thick steel bars. And the plaque he wore around his neck wasn't wooden, like the others, but an iron door taken from a laboratory oven. His name was written on the door in striking black characters, and two red diagonals were drawn across them in a large X. Twice the number of Red Guards used for other victims escorted Ye onto the stage: two men and four women. The two young men strode with confidence and purpose, the very image of mature Bolshevik youths. They were both fourth-year students4 majoring in theoretical physics, and Ye was their professor. The women, really girls, were much younger, second-year students from the junior high school attached to the university.5 Dressed in military uniforms and equipped with bandoliers, they exuded youthful vigor and surrounded Ye Zhetai like four green flames. His appearance excited the crowd. The shouting of slogans, which had slackened a bit, now picked up with renewed force and drowned out everything else like a resurgent tide. After waiting patiently for the noise to subside, one of the male Red Guards turned to the victim. "Ye Zhetai, you are an expert in mechanics. You should see how strong the great unified force you're resisting is. To remain so stubborn will lead only to your death! Today, we will continue the agenda from the last time. There's no need to waste words. Answer the following question without your typical deceit: Between the years of 1962 and 1965, did you not decide on your own to add relativity to the intro physics course?" "Relativity is part of the fundamental theories of physics," Ye answered. "How can a basic survey course not teach it?" "You lie!" a female Red Guard by his side shouted. "Einstein is a reactionary academic authority. He would serve any master who dangled money in front of him. He even went to the American Imperialists and helped them build the atom bomb! To develop a revolutionary science, we must overthrow the black banner of capitalism represented by the theory of relativity!" Ye remained silent. Enduring the pain brought by the heavy iron hat and the iron plaque hanging from his neck, he had no energy to answer questions that were not worth answering. Behind him, one of his students also frowned. The girl who had spoken was the most intelligent of the four female Red Guards, and she was clearly prepared, as she had been seen memorizing the struggle session script before coming onstage. But against someone like Ye Zhetai, a few slogans like that were insufficient. The Red Guards decided to bring out the new weapon they had prepared against their teacher. One of them waved to someone offstage. Ye's wife, physics professor Shao Lin, stood up from the crowd's front row. She walked onto the stage dressed in an ill-fitting green outfit, clearly intended to imitate the military uniform of the Red Guards. Those who knew her remembered that she had often taught class in an elegant qipao, and her current appearance felt forced and awkward. "Ye Zhetai!" She was clearly unused to such theater, and though she tried to make her voice louder, the effort magnified the tremors in it. "You didn't think I would stand up and expose you, criticize you? Yes, in the past, I was fooled by you. You covered my eyes with your reactionary view of the world and science! But now I am awake and alert. With the help of the revolutionary youths, I want to stand on the side of the revolution, the side of the people!" She turned to face the crowd. "Comrades, revolutionary youths, revolutionary faculty and staff, we must clearly understand the reactionary nature of Einstein's theory of relativity. This is most apparent in general relativity: Its static model of the universe negates the dynamic nature of matter. It is anti-dialectical! It treats the universe as limited, which is absolutely a form of reactionary idealism...."
As he listened to his wife's lecture, Ye allowed himself a wry smile. Lin, I fooled you? Indeed, in my heart you've always been a mystery. One time, I praised your genius to your father--he's lucky to have died early and escaped this catastrophe--and he shook his head, telling me that he did not think you would ever achieve much academically. What he said next turned out to be so important to the second half of my life: "Lin Lin is too smart. To work in fundamental theory, one must be stupid." In later years, I began to understand his words more and more. Lin, you truly are too smart. Even a few years ago, you could feel the political winds shifting in academia and prepared yourself. For example, when you taught, you changed the names of many physical laws and constants: Ohm's law you called resistance law, Maxwell's equations you called electromagnetic equations, Planck's constant you called the quantum constant.... You explained to your students that all scientific accomplishments resulted from the wisdom of the working masses, and those capitalist academic authorities only stole these fruits and put their names on them. But even so, you couldn't be accepted by the revolutionary mainstream. Look at you now: You're not allowed to wear the red armband of the "revolutionary faculty and staff"; you had to come up here empty-handed, without the status to carry a Little Red Book.... You can't overcome the fault of being born to a prominent family in pre-revolutionary China and of having such famous scholars as parents. But you actually have more to confess about Einstein than I do. In the winter of 1922, Einstein visited Shanghai. Because your father spoke fluent German, he was asked to accompany Einstein on his tour. You told me many times that your father went into physics because of Einstein's encouragement, and you chose physics because of your father's influence. So, in a way, Einstein can be said to have indirectly been your teacher. And you once felt so proud and lucky to have such a connection. Later, I found out that your father had told you a white lie. He and Einstein had only one very brief conversation. The morning of November 13, 1922, he accompanied Einstein on a walk along Nanjing Road. Others who went on the walk included Yu Youren, president of Shanghai University, and Cao Gubing, general manager of the newspaper Ta Kung Pao. When they passed a maintenance site in the road bed, Einstein stopped next to a worker who was smashing stones and silently observed this boy with torn clothes and dirty face and hands. He asked your father how much the boy earned each day. After asking the boy, he told Einstein: five cents. This was the only time he spoke with the great scientist who changed the world. There was no discussion of physics, of relativity, only cold, harsh reality. According to your father, Einstein stood there for a long time after hearing the answer, watching the boy's mechanical movements, not even bothering to smoke his pipe as the embers went out. After your father recounted this memory to me, he sighed and said, "In China, any idea that dared to take flight would only crash back to the ground. The gravity of reality is too strong." "Lower your head!" one of the male Red Guards shouted. This may actually have been a gesture of mercy from his former student. All victims being struggled against were supposed to lower their heads. If Ye did lower his head, the tall, heavy iron hat would fall off, and if he kept his head lowered, there would be no reason to put it back on him. But Ye refused and held his head high, supporting the heavy weight with his thin neck. "Lower your head, you stubborn reactionary!" One of the girl Red Guards took off her belt and swung it at Ye. The copper belt buckle struck his forehead and left a clear impression that was quickly blurred by oozing blood. He swayed unsteadily for a few moments, then stood straight and firm again. One of the male Red Guards said, "When you taught quantum mechanics, you also mixed in many reactionary ideas." Then he nodded at Shao Lin, indicating that she should continue. Shao was happy to oblige. She had to keep on talking, otherwise her fragile mind, already hanging on only by a thin thread, would collapse completely. "Ye Zhetai, you cannot deny this charge! You have often lectured students on the reactionary Copenhagen interpretation of quantum mechanics." "It is, after all, the explanation recognized to be most in line with experimental results." His tone, so calm and collected, surprised and frightened Shao Lin. "Should philosophy guide experiments, or should experiments guide philosophy?" Ye's sudden counterattack shocked those leading the struggle session. For a moment they did not know what to do. "Of course it should be the correct philosophy of Marxism that guides scientific experiments!" one of the male Red Guards finally said. "Then that's equivalent to saying that the correct philosophy falls out of the sky. This is against the idea that the truth emerges from experience. It's counter to the principles of how Marxism seeks to understand nature." Shao Lin and the two college student Red Guards had no answer for this. Unlike the Red Guards who were still in junior high school, they couldn't completely ignore logic. But the four junior high girls had their own revolutionary methods that they believed were invincible. The girl who had hit Ye before took out her belt and whipped Ye again. The other three girls also took off their belts to strike at Ye. With their companion displaying such revolutionary fervor, they had to display even more, or at least the same amount. The two male Red Guards didn't interfere. If they tried to intervene now, they would be suspected of being insufficiently revolutionary. "You also taught the big bang theory. This is the most reactionary of all scientific theories." One of the male Red Guards spoke up, trying to change the subject. "Maybe in the future this theory will be disproven. But two great cosmological discoveries of this century--Hubble's law, and observation of the cosmic microwave background–show that the big bang theory is currently the most plausible explanation for the origin of the universe." "Lies!" Shao Lin shouted. Then she began a long lecture about the big bang theory, remembering to splice in insightful critiques of the theory's extremely reactionary nature. But the freshness of the theory attracted the most intelligent of the four girls, who couldn't help but ask, "Time began with the singularity? So what was there before the singularity?" "Nothing," Ye said, the way he would answer a question from any curious young person. He turned to look at the girl kindly. With his injuries and the tall iron hat, the motion was very difficult. "No... nothing? That's reactionary! Completely reactionary!" the frightened girl shouted. She turned to Shao Lin, who gladly came to her aid. "The theory leaves open a place to be filled by God." Shao nodded at the girl. The young Red Guard, confused by these new thoughts, finally found her footing. She raised her hand, still holding the belt, and pointed at Ye. "You: you're trying to say that God exists?" "I'm saying I don't know. If by 'God' you mean some kind of superconsciousness outside the universe, I don't know if it exists or not. Science has given no evidence either way." Actually, in this nightmarish moment, Ye was leaning toward believing that God did not exist. This extremely reactionary statement caused a commotion in the crowd. Led by one of the Red Guards on stage, another tide of slogan-shouting exploded. "Down with reactionary academic authority Ye Zhetai!" "Down with all reactionary academic authorities!" "Down with all reactionary doctrines!" Once the slogans died down, the girl shouted, "God does not exist. All religions are tools concocted by the ruling class to paralyze the spirit of the people!" "That is a very one-sided view," Ye said calmly. The young Red Guard, embarrassed and angry, reached the conclusion that, against this dangerous enemy, all talk was useless. She picked up her belt and rushed at Ye, and her three companions followed. Ye was tall, and the four fourteen-year-olds had to swing their belts upward to reach his head, still held high. After a few strikes, the tall iron hat, which had protected him a little, fell off. The continuing barrage of strikes by the metal buckles finally made him fall down. Ye's two students had finally had enough. "The chairman instructed us to 'rely on eloquence rather than violence'!" They rushed over and pulled the four semicrazed girls off Ye. But it was already too late. The physicist lay quietly on the ground, his eyes still open as blood oozed from his head. The frenzied crowd sank into silence. The only thing that moved was a thin stream of blood. Like a red snake, it slowly meandered across the stage, reached the edge, and dripped onto a chest below. The rhythmic sound made by the blood drops was like the steps of someone walking away. A cackling laugh broke the silence. The sound came from Shao Lin, whose mind had finally broken. The laughter frightened the attendees, who began to leave the struggle session, first in trickles, and then in a flood. The exercise grounds soon emptied, leaving only one young woman below the stage. She was Ye Wenjie, Ye Zhetai's daughter. As the four girls were taking her father's life, she had tried to rush onto the stage. But two old university janitors held her down and whispered into her ear that she would lose her own life if she went. The mass struggle session had turned into a scene of madness, and her appearance would only incite more violence. She had screamed and screamed, but she had been drowned out by the frenzied waves of slogans and cheers. When it was finally quiet again, she was no longer capable of making any sound. She stared at her father's lifeless body, and the thoughts she could not voice dissolved into her blood, where they would stay with her for the rest of her life. After the crowd dispersed, she remained like a stone statue, her body and limbs in the positions they were in when the two old janitors had held her back. After a long time, she finally let her arms down, walked slowly onto the stage, sat next to her father's body, and held one of his already-cold hands, her eyes staring emptily into the distance. When they finally came to carry away the body, she took something from her pocket and put it into her father's hand: his pipe. Wenjie quietly left the exercise grounds, empty save for the trash left by the crowd, and headed home. When she reached the foot of the faculty housing apartment building, she heard peals of crazy laughter coming out of the second-floor window of her home. That was the woman she had once called mother. Wenjie turned around, not caring where her feet would carry her. Finally, she found herself at the door of Professor Ruan Wen. Throughout the four years of Wenjie's college life, Professor Ruan had been her advisor and her closest friend. During the two years after that, when Wenjie had been a graduate student in the Astrophysics Department, and through the subsequent chaos of the Cultural Revolution, Professor Ruan remained her closest confidante, other than her father. Ruan had studied at Cambridge University, and her home had once fascinated Wenjie: refined books, paintings, and records brought back from Europe; a piano; a set of European-style pipes arranged on a delicate wooden stand, some made from Mediterranean briar, some from Turkish meerschaum. Each of them seemed suffused with the wisdom of the man who had once held the bowl in his hand or clamped the stem between his teeth, deep in thought, though Ruan had never mentioned the man's name. The pipe that had belonged to Wenjie's father had in fact been a gift from Ruan. This elegant, warm home had once been a safe harbor for Wenjie when she needed to escape the storms of the larger world, but that was before Ruan's home had been searched and her possessions seized by the Red Guards. Like Wenjie's father, Ruan had suffered greatly during the Cultural Revolution. During her struggle sessions, the Red Guards had hung a pair of high heels around her neck and streaked her face with lipstick to show how she had lived the corrupt lifestyle of a capitalist. Ruan was sitting on the chair before her desk, her eyes closed. Wenjie stood next to Ruan and gently caressed her professor's forehead, face, and hands--all cold. Wenjie had noticed the empty sleeping pill bottle on the desk as soon as she came in. She stood there for a while, silent. Then she turned and walked away. She could no longer feel grief. She was now like a Geiger counter that had been subjected to too much radiation, no longer capable of giving any reaction, noiselessly displaying a reading of zero. But as she was about to leave Ruan's home, Wenjie turned around for a final look. She noticed that Professor Ruan had put on makeup. She was wearing a light coat of lipstick and a pair of high heels.